After Hurricane Irene missed us here in Florida it did have a huge ocean surge impacting the beaches. I was searching up were you can see the ocean surge went and running my detector over some of the seaweed hoping to maybe find lost lost jewlery. My detector went off and I start to dig with my surprise there was a coin, but as I pulled the one coin I noticed about 5 more. I could tell they were old by the condition. After looking at the coins I saw they were foreign, and not that old around 1980. 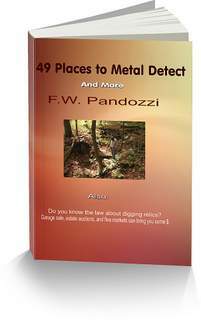 My detector went off again same spot so we kept digging. The more we dug the more coins we found. The deeper we dug the older they got. I am baffled because all of these coins were found in on hole by the time we were done digging it was about 2 feet wide and the last coin we dug up was about 2 feet deep a 1902 Shilling. Most of the coins are foreign and most dates are in the 1930, 40's and 50's. 178 COINS TOTAL AND 1 BUFFALO ALL IN ONE HOLE. 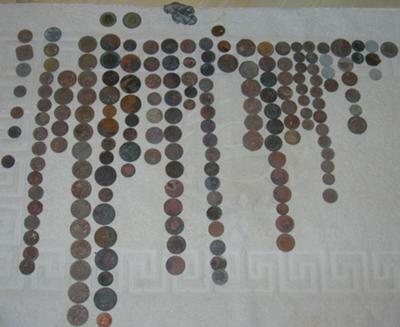 and also found about 18 foreign coins dated from 1902 to 1922. I also found one Pueter Buffalo about 12 inches deep. The currency was mixed from coins from France, Germany, Britian, Bahamas, Chile, Panama, Belize, Asian, Canada, Bermuda,Florin, Dates ranging from 1902 through 1984. I don't think they are worth anything will have to investigate. But does anyone have an idea on why so many foreign coins could end up in one spot on the beach in South Florida, several feet down from all years, and from all over, and you can tell by condiotion have been there for quite awhile! Either way my son and I were excited and think we should check that area a little better. Any thoughts? I believe your find is the scattered pieces of someone's personal collection. A combination of the specific countries and dates on the older coins is someone's collection of a tour of duty in WWII. It maybe the mystery novel lover in me but, just to offer up a possible explanation is a penny theft robbery. Possible someone very inexperienced which may suggest some misguided youth. Possibly took the money from a neighbor or grandparent. Possibly something they found hidden in the house or garage. There was probably quarters and silver dollars in it. They probably took what they thought they could spend without getting questioned or worse caught, then buried the remainder or the coins on the beach. Just making a stab at how that mix of coins could have found themselves in one two foot hole on the beach. If we have another, or when we have another hurricane on the texas coast, it has been my plan to do the same kind of hunting. Chad, thanks for the story and the picture. I loved the fact that you found so many coins in a hole. I have no idea why. But perhaps one of our readers can offer an explanation.